Syrian President Bashar Assad said the victory proves the success of the army's strategy in combating terrorism. 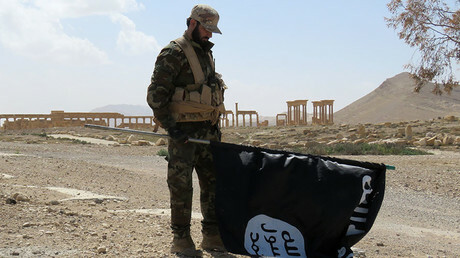 "The liberation of the historic city of Palmyra today is an important achievement and another indication of the success of the strategy pursued by the Syrian army and its allies in the war against terrorism," he told a French delegation on Sunday, according to Syrian TV. "Our troops have established full control of the town and are chasing the remainder of the retreating gangs of Islamic State terrorists," the Syrian army's command said in a statement, as quoted by TASS. A Syrian army officer told RT that preparation for the operation took a little over a month, and involved planned cooperation with the Russian military. 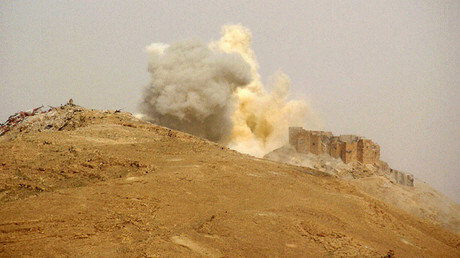 “The primary goal was to carry out attacks to retake the heights and regions near Palmyra. Yesterday (Saturday) we managed to seize the ancient Palmyra fortress. Then the preparations to retake Palmyra city itself were carried out. Daesh (IS) terrorists blew up the bridge leading to the fortress. That’s the reason why ground troops under the cover of artillery and tank fire entered the city from the north and freed these districts,” the officer said. A commander of the Desert Falcons unit of the Syrian army told RT that the "military operation to retake Palmyra lasted three days," adding that the "main difficulty was that there were a lot of mines along the roads." "Today the Syrian Arab Army is clearing the mines," he said. 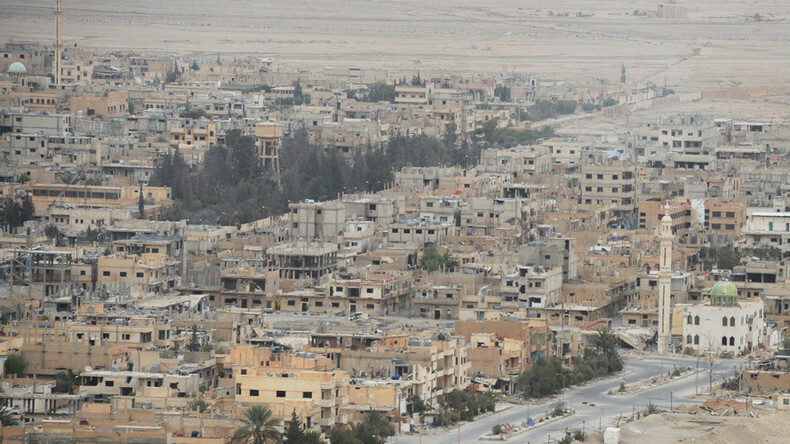 The army general command stated that Palmyra would now become “a launchpad to expand military operations” against the group in Raqqa and Deir Ezzor, Reuters reported. IS fighters have reportedly retreated from Palmyra – located 215 kilometers (133.5 miles) from the Syrian capital Damascus – to the towns of Sukhnah, Raqqa, and Deir Ezzor. In a statement read on Syrian television, the military command said the recapture of Palmyra marks the beginning of the collapse of Islamic State (IS, formerly ISIS/ISIL). It said the success proves that the Syrian government and its allies are the only forces capable of defeating terrorism in the country. On Sunday, Russian President Vladimir Putin congratulated Assad on retaking Palmyra from IS. The two held a telephone conversation during which Putin stressed the importance of preserving the UNESCO World Heritage Site. Putin added that “Russia’s forces will continue to help the Syrian authorities in their anti-terrorist efforts,” Kremlin spokesman Dmitry Peskov said. The Russian Defense Ministry said on Sunday that over 80 militants were killed in Russian airstrikes which hit 117 terrorist military facilities in the Palmyra area. “Russian Air Forces carried out 40 sorties to Palmyra’s area within 24 hours,” the Russian Center for Reconciliation in Syria said. It added that eight command center buildings, 12 bases, two tanks, three artillery units, eight vehicles, and six ammunition warehouses were destroyed in the strikes. The recapture of Palmyra marks the biggest reversal for IS since Russia's intervention into Syria. The Desert Falcons commander thanked Russia for the victory, noting that Moscow "helped our country and our army against Daesh (ISIS) and its supporters." Noting the significance of Palmyra, journalist Neil Clark told RT that having control of the city is "incredibly important." “...It's on the main highway, sort of equidistant between Damascus and Deir Ezzor...the Syrian army has [now] got a major boost in clearing IS out of a whole path of Syria, where [IS militants still are]," he said. That thought was echoed by political analyst Talib Ibrahim, who told RT that "the location of Palmyra is key to other [areas]" and that "the Syrian army can [now] go for Raqqa or Deir Ezzor." "I think this is a real turning point and a very important strategic achievement," he said. Clark noted that the success came less than six months after the Russian intervention in Syria, calling Moscow's action a "game changer." Former US ambassador to Russia Michael McFaul tweeted “thank you” in Russian following a report of the Syrian government's successful recapture of Palmyra. "We will rebuild them with the stones that remain, and with the remaining columns," Abdelkarim told Reuters, adding that his team would "bring life back to Palmyra." However, Giovanni Boccardi of UNESCO's Emergency Preparedness and Response Unit told RT that it remains unclear what can be restored or rescued. “We are looking at the web and we have seen footage of the city as it looks today, and it looks that there might be even more destruction than what we expected, so it is critical now to be able to go there and to conduct a total assessment as soon as the security conditions will allow," he said. “Any kind of salvaging will have to wait until there is peace on the ground. It will be very complicated,” he said, noting media reports of mine fields. But international lawyer and author of 'Syria's Endangered Heritage,' Franklin Lamb, told RT that he is optimistic that Palmyra's historic sites can be largely restored. “I predict that between 90 and 95 percent of all the damage that IS has done to Palmyra can be restored” with technology, he said.